1 Pair of Socks: $6.956-11 Pair: $6.75 ea.12 and up: $6.50 ea. 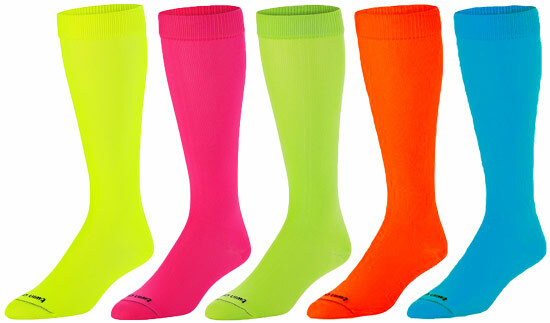 BRIGHT NEON KNEE HIGH SOCKS ... Make a Bold statement with these Very Bright & Colorful Neon Stretchy Florescent Tube Socks. Twin City Brand Colorful Nylon and Polyester Blend Tube Socks feature Sewn-in Heel Construction, ProDRI Moisture Management, Blister Control protection, and AntiMicrobial deodorant agents. Florescent Neon Tube Sock Material: 60% Nylon, 38% Polyester & 2% Spandex. Neon Knee High Socks Sizing: * * (approx. sizes) Socks will fit tight & may run slightly smaller than shoe sizes listed below. They are NOT intended to be worn over shin guards, etc. * You can Mix & Match Sizes & Colors to get Quantity Prices! Care Instructions: Machine Wash and Tumble Dry Inside Out after each use, using Fabric Softener is recommended . . . Do Not Bleach. 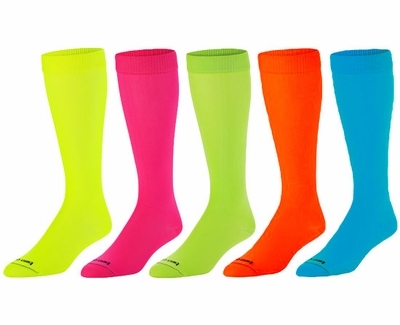 Neon Sock Colors: (as shown above - Left to Right) � Neon Yellow/Safety Green, � Neon Hot Pink, � Neon Green, � Neon Orange, � Bright Electric Blue. These Bright and Colorful Neon Athletic Tube Socks can be worn while playing many Sports: Volleyball, Soccer, Basketball, Softball, Cheer, Dance, Lacrosse, Baseball, Football, Running, etc... so make sure to buy enough for the whole team. NOTE: We've done our best to show the true color of these Bright Tube Socks, however since all monitor resolutions and brightness settings are different, these bright neon colors may look different on your computer screen. PLEASE call us if you have any questions about color-matching to uniforms, etc. Thank You. I liked the socks for the neon colors and the fact that one could purchase the correct size. I bought four pairs for my two grandsons, ages 8 and 10, and they loved them. A much thinner sock than we expected. Would have been great for summer ball team, but, some of the girls are tall and the sock just doesn't come up high enough for them. Socks exactly as expected, shipping costs are high. Website picture is true to color and fast delivery!! Great material and you can tell they are a higher grade than most socks. I bought these socks for my girls LL softball team. They love them and they are a great quality for the price! I would recommend them. ProsThe color is bright and they don't seam to be fading.